– In improv comedy, professional actors use carefully designed exercises to develop spontaneity and a quick wit. – It’s what allows them to come up with a never-ending stream of FUN, relevant things to say in the moment. – And you’re about to discover how you can also feel confident knowing what to say, on the spot, no matter who you’re with. …by using the same unusual strategy (merged with tested social psychology) to become THAT person people desperately want in their lives. Reframe the way you think about your social ability and making friends. Debunk a lot of the confidence and charisma hype you’ve been exposed to. …and give you a simple, step by step strategy that’ll transform every social encounter you have into an opportunity to connect, make new friends, and enjoy life fully. Over the last 5 years, this unconventional strategy has been responsible for 100s of lives moving across the spectrum, from shy to more confident and outgoing. Leveraging the latest cutting edge research into social psychology and shyness therapy. AND the approach of improv actors who train to be quick on their feet. Inventing fun, engaging stories in seconds. …to come up with relevant, engaging things to talk about. This unique style of practical training exercises is how they do it. And below, I’m going to show you how you can easily trigger this hack to become a natural (i.e. REAL) version of you who is ALSO charming. So people invite you into their lives yet respect and like you for YOU. Which will give you the almost magical ability to “make things happen” socially wherever you are. The power to experience these types of results doesn’t come from JUST skills. It also requires you to GO DEEPER and develop TRUE confidence. The kind that lasts. That’s ALWAYS on. So you don’t have to think about it anymore. Most top shyness experts agree that addressing the CORE ISSUES causing your nervousness is key. Which is why shyness and anxiety researchers like Philip Zimbardo, Bernardo Carduchi, Aaron Beck and Albert Ellis recommend the same types of strategies included in this system. Social psychology methods backed by mountains of research papers. If you often feel too quiet, insecure or awkward socially, read every word on this page. But what I expose to you to today will be far different (more effective) than anything you’ve been taught about charm and social skills. It’ll probably change the way you go about socializing. You’ve come through the other side as confident, more talkative, and easily able to connect. Even if it seems you never know what to say. Even if you sometimes feel boring and like you have nothing to offer. Even if you’ve been stuck in a cycle of trying and failing. You can be more yourself AND still charm others without acting fake, needing therapists, pills, OR ridiculous sounding advice that’s too intimidating to act on. You are literally missing out — spending time alone that could be with new friends and experiences. You don’t want that. Neither do I. So let’s start right away with a bit of background. 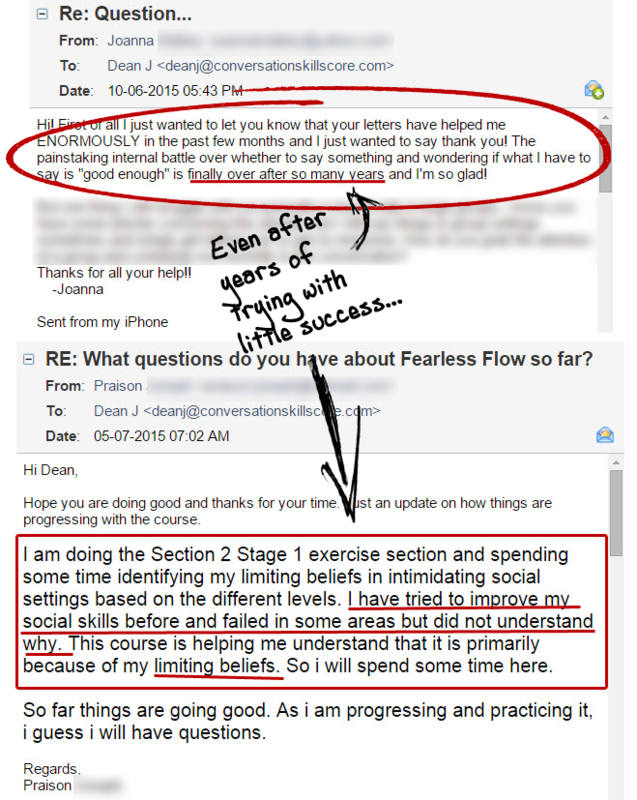 I’m the creator of Fearless Flow – the conversation and confidence system you’re going to read about here. I’ve seen TONS of gimmicks and “overnight results” strategies come and go. I’ve seen the rise in popularity of “natural” anxiety pills. Some had good experiences, some not so much. The people who built confidence and fun social lives had a willingness to be BOLD. Which sounds bolder? And which do you think is where trustworthy friendships are made? Most people go through the first group at the start. Maybe we were duped into it by some trickster. Sold a lie. Or simply not given the right information. The reason doesn’t matter. It’s all a natural part of the personal development process. Like most peeps, when I started, I was struggling in the first group. And I more-or-less developed the Fearless Flow framework in a desperate attempt to find something… anything… that would finally get some real results. But it’s how my first “A-ha!” moment happened. I was about half-way through college. Had just finished late at my part-time job. And now I was at a bar. Which was uncommon for me. Since almost EVERY time I’d been to a bar I’d become a wall-flower. Watching all the “interesting people” do the talking. For most my life, I’d been quiet and awkward. I never knew what to say. Or where to take things. I feared others wouldn’t accept what I said. So people would ignore me and consider me not worth their time. It was like I made them uncomfortable or something. Yet they still brushed me off and pulled away. My confidence and skills were so inconsistent. Plus I hated acting fake and holding back just to try and fit in. It hurt to feel worthless and miss out on my life. So many times I decided maybe I was a hopeless case. That I was just meant to stay alone my whole life. 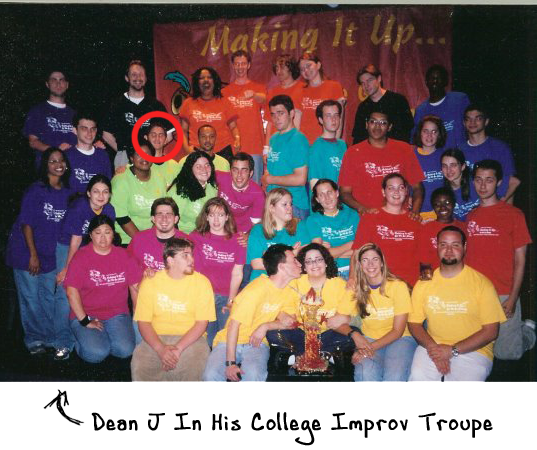 But I stuck with it (hard-headed Dean). 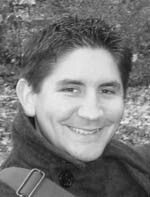 And eventually – after chasing every bit of general “just be yourself” advice, “instant popularity” claims and ridiculous sounding word for word scripts — I stumbled into social psychology and improv around the same time. Like everybody else, I knew confidence was the single most important quality to gain acceptance and friends. …but I’d never understood it. I’d heard SO many suggestions to “just be confident.” Yet I could never get it to work. No one ever explained how you become confident. That’s why when I started digging into the REAL research and psychology, I loved it. Because it was about getting down to the deeper issues causing my insecurity. About taking responsibility for my own life. And not fearing anymore to be ME. I felt lighter. Because I saw I didn’t have to hide who I was anymore. Honesty and what I wanted from life were my guides. I’d finally discovered a way to confidently connect with the people around me. Something I’d struggled with my whole life. But up till that night in the bar, I didn’t feel I’d made much progress. My results were “under the radar” so to speak. 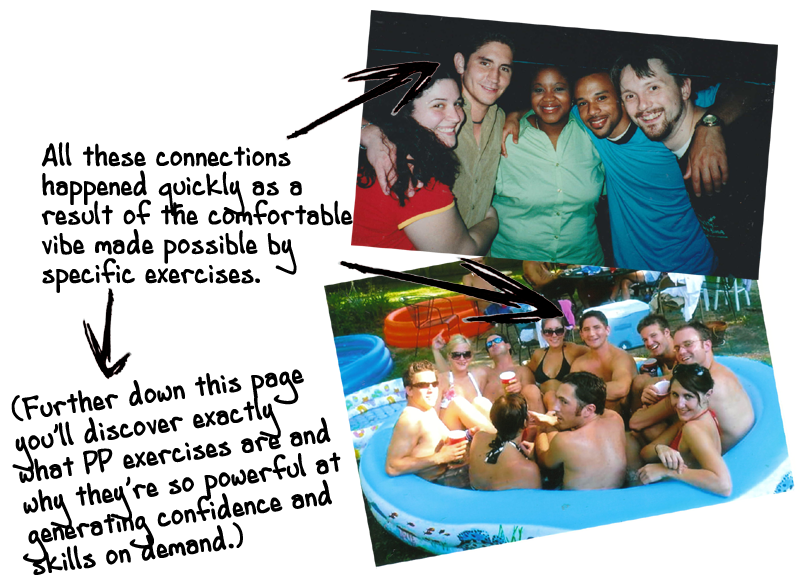 I ended up staying friends with some of those “strangers” after that night (so did some of my co-workers). 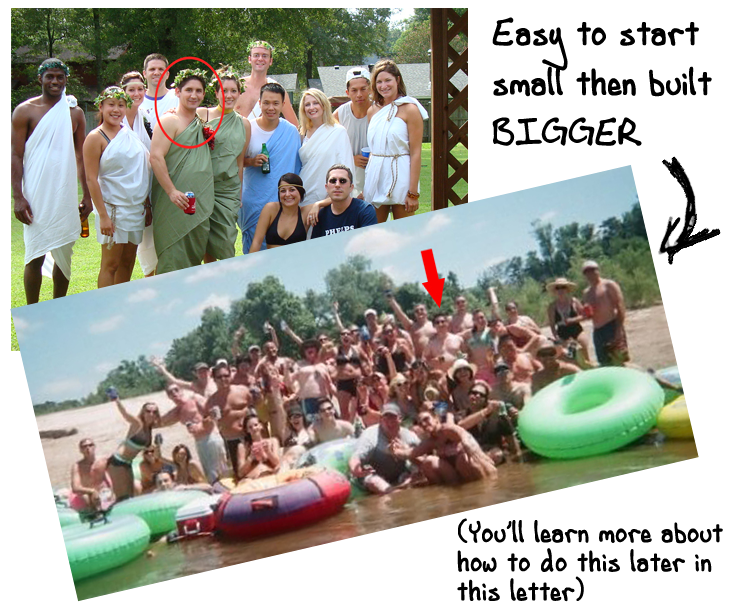 All from a couple months of “unusual” exercises and learning a small handful of high-impact social skills. But going from VERY few friends through childhood and my adult life (to that point), to a full social circle in a couple months? … that’s not even the biggest reason I was so shocked. I just wasn’t into the “mainstream” interests of most people around me. Which is why people often called me “the weirdo” as a child. My whole life these “handicaps” were there… crippling me. Always taunting me. Filling me with doubt. If I can do this, believe me… anyone can. I had zero self-esteem and social skills… the last person anyone would expect to be charming and natural with people (myself included). The single best feeling I ever had… I get goose bumps just thinking about it. Finally, that weight was lifted off my shoulders. Able to “make things happen socially” and stop missing out on my life. That’s the beauty of the Fearless Flow framework. It doesn’t require you already be confident or skilled socially. OR that you “fit the mold” of the crowd. Just a firm decision to be real and unapologetic for who you are – which anyone can do. Which is exactly what happened after my night in the bar. I started experimenting with more social challenges. Other “problem areas” in my life. I quickly became better at dating, throwing popular house parties, professional communications, public speaking, doing well with “intimidating” people. I tried it in all of them (successfully). The concept worked for me like clockwork in every social situation I once struggled. And then… just like that. …I had more lined up to do socially in a month than I used to in a whole year. 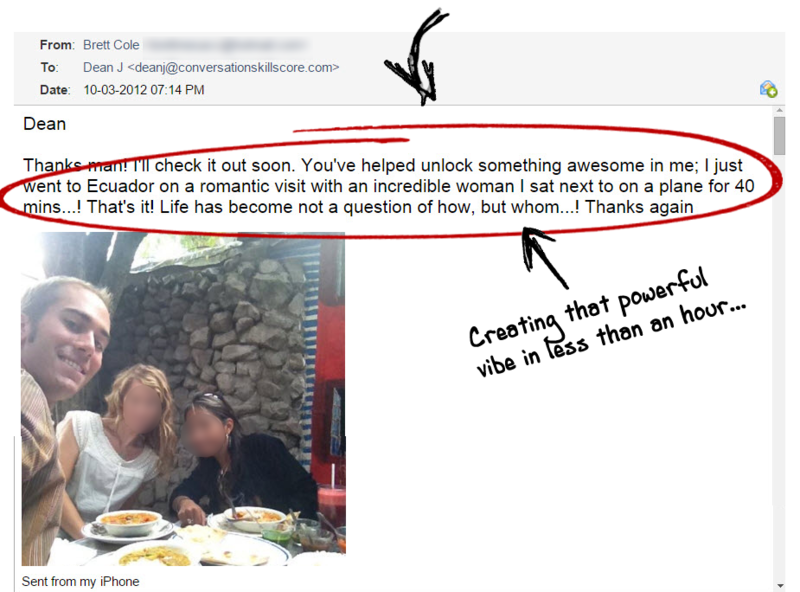 Conversation starters … “secret” power words and phrases … the law of attraction. … the magic bullets everyone talks about. Yet… it’s more valuable than lots of money, good looks or a fancy car. …the thing that will “make up” for how inferior you feel deep down. Buying more books of 101 conversation techniques. …resorting to believing “weird-trick” hyped-up claims. Banging your head against a wall trying to figure out what to do first. What works best. And feeling guilty you don’t know MORE. All the while becoming more and more overwhelmed with TOO MANY tactics in your head at once. To the point you come across MORE awkward than before while talking. Then, when those instant techniques “don’t work for you,” you feel worse about yourself. Like YOU just can’t do this. So you go out looking for more tricks. Because maybe the next one is the one you’ve been “missing” all this time. It’s a sad, frustrating hamster wheel. 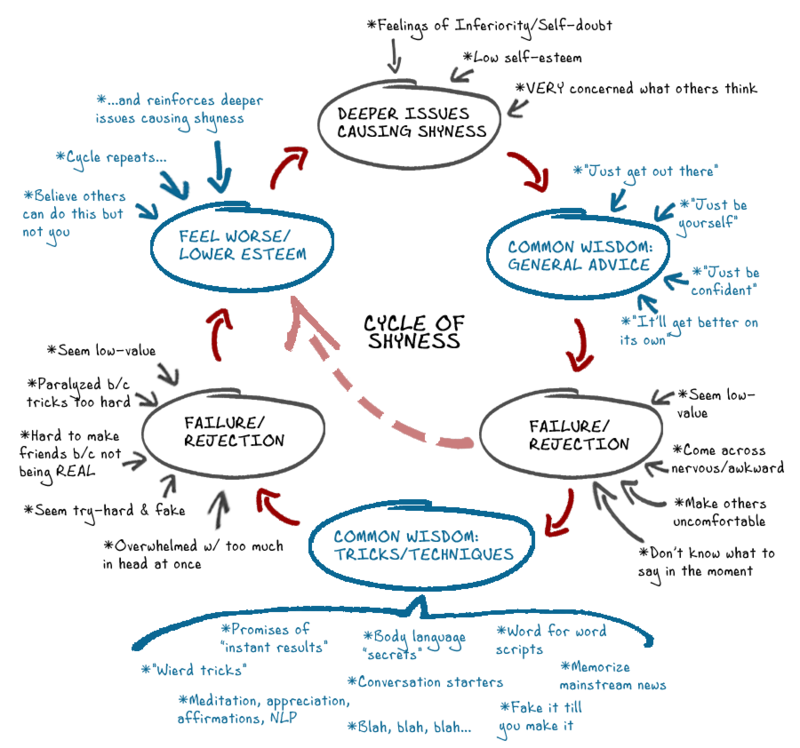 The common conversation advice can be a MAJOR cause of the Shyness Cycle. Yet, truly have that bold, comfortable vibe… and the entire dynamic shifts. You don’t need all the gimmicks. People in your daily life are naturally pulled to you. They look forward to seeing you again. Including you as a normal and welcome part of their group. And eagerly accepting (and issuing) invites to do things as a natural consequence of the way they feel when with you. In short, they trust you, like you, and enjoy spending time with you. And when you have those things, you’re on a rocket ship. There’s no limit to how high you can go. And it’s a cool way to BE socially. I’m not a social rockstar. You don’t have to master ALL the social graces. Or memorize today’s mainstream topics. You don’t have to ALWAYS say the “right thing.” Or summon high-energy positivity 24/7. ‘Cause this dynamic actually makes it easier for people who aren’t “like that” to get results. Let’s face it — the traditional, “just get out there and try this crazy technique” approach isn’t usually effective for those of us who suffered shyness most our lives. It’s too far outside our comfort zones too soon. And it’s often the reason you might feel too nervous and freeze up trying to be more outgoing. So we need a different (new) approach. And truly believing in our own self-worth (so we’re less intimidated around others) is it. Because once people see you are OK with YOU, they want to be a part of that. A part of your life. They sense you’re not needy. …so even if you “say something silly” or don’t share their opinions, it won’t matter. …“impressing” them so they’ll like you becomes unnecessary. And as a result, you won’t have to be fake, bubbly, or zany to try and fit in. You can be true to YOUR personality yet still have success. When you have a strong sense of self-esteem, THEN approach people to talk, you can build connections the first time you meet. That night in the bar… for example … was the first time I fully had that bold, comfortable vibe with strangers. We all felt it within minutes of meeting. My final year of college was a blur. I radiated that bold, comfortable vibe in all the various groups I’d joined. And made new friends left and right. I began dating regularly. For the first time. My new found confidence allowed me to apply for and get a job on cruise ships. In other words, one of the FUN people. Who gets up in front of the guests, on microphone, and hosts events like karaoke, pool games and more. And in my 5 years working on ships, I literally made friends from around the world. We went on SO many fun adventures together. Something I’d never have been able to do with my previous shyness and insecurity. Relying on others to befriend me first was now a thing of the past. I knew exactly what to do. I had a system. I knew exactly how to use exercises in a way that almost “magically” resulted in people inviting me into their inner circle within hours to days of meeting me. 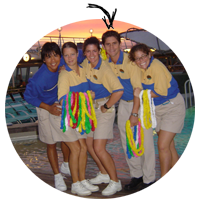 When I finished working on cruise ships, I came back home and had to start my social circle over from scratch. I quickly gathered a core group of loyal friends around me. Then together, we had a blast. Meeting dozens of new friends through parties and fun get-togethers. Some huge groups of 50 or more. Some intimate and cozy. There have been other great times. Many others in fact. More than I can count. 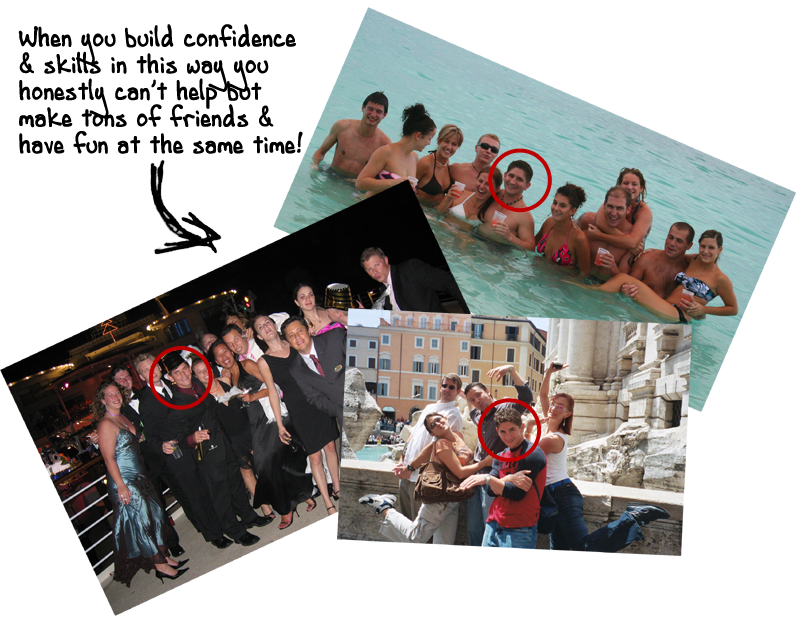 I put together a simple document for my “inner circle” of close friends. I just wanted to become confident socially myself. That stuff is for posers. Sure, it can get you some attention sometimes. But eventually, people grow tired of the “tactics.” And it burns your reputation to the ground. Always having to “muster up” your confidence… Remembering tons of techniques and worrying what you “should and shouldn’t say”… Always feeling drained because deep down you still feel inadequate. How Do You Build A Genuine, Bold, Comfortable Vibe (Even Around Intimidating People)? The best way to develop a bold, comfortable vibe, no matter who you’re with, is by using “Perception Patterning ™” exercises. 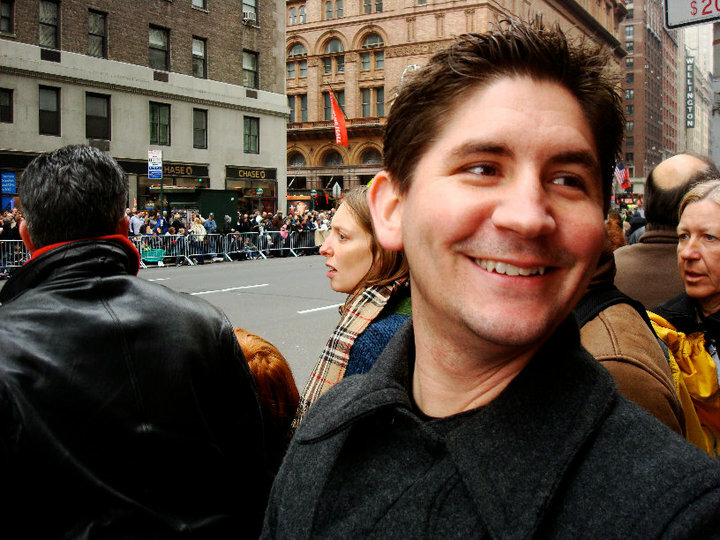 Practical exercises are the same way professional improv comedy performers build a fun, fast wit. Since they can’t rehearse in advance. They develop the ability to think up what to say in the moment. Why do they all rely on exercises to quickly help them master their skills? Increased Focus. Less Overwhelm. Faster Results. In all the above professions, dozens of skills are needed for success. Yet if the professionals were to train ALL those skills at once, it would be overwhelming. 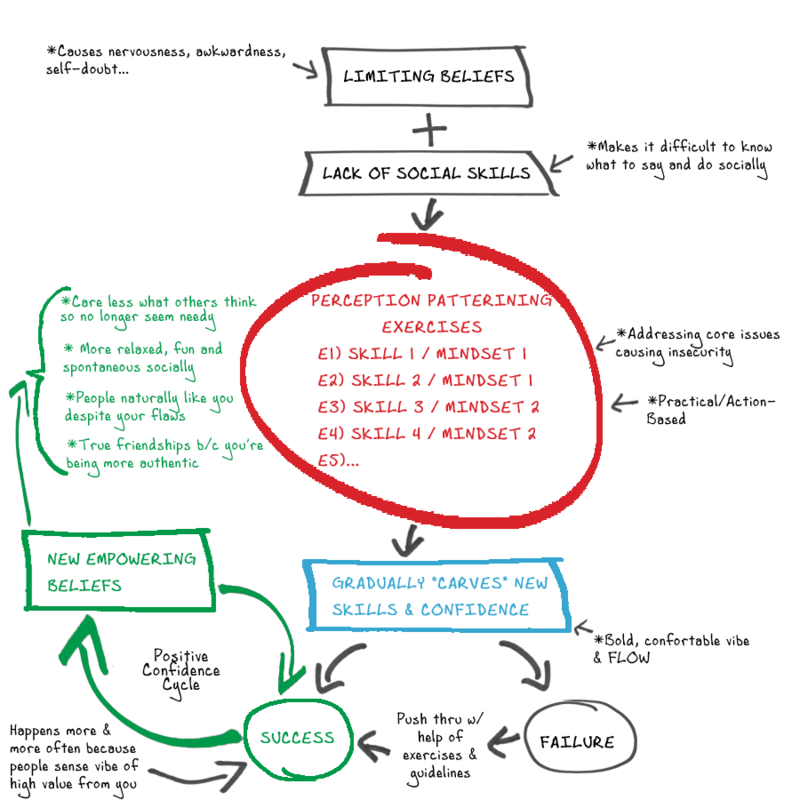 None of the necessary skills would become polished. So they’d get inconsistent results. And their training would take a lot longer. Conversation is the same way. …THEN move on to the next in a strategic way. You don’t get stuck in your head. Trying to remember 101 different tactics at once. You easily (and quickly) sharpen the tools of charm. So they’re there when you need them. No matter the circumstances. Like the military officer who drills disassembling then reassembling his firearm. …without having to think about it. It’s a simple yet deceptively powerful strategy. And it works for beating shyness and building conversation flow like clockwork. This is the strategy that finally let me build lasting confidence. But it works just as effectively in more day to day and casual interactions. As you may have noticed, I’ve spoken out against a “technique-based” approach A LOT. ‘Cause they’re a waste of time (at least the way almost everyone does them). Unless you already have a decent level of confidence, those “flashy” techniques won’t work so well for you. They can make you seem try-hard and needy. Since your confidence isn’t congruent with the outrageous tactics, it’s easy to come across awkward. Unnatural. It’s because most “experts” giving advice on shyness and social anxiety don’t understand the self-doubt people like us deal with. They assume we’re already confident. Yet for some reason, it’s still what everyone does. But…remember, we’re bold. When everyone else follows the common advice, we go deeper. …even when they first meet me. This is because it maximizes both the skills to flow in conversations, and the authenticity necessary for you to build long-term relationships. And making yourself feel even worse. …this actually enhances your image with everyone you meet. And makes new people more responsive and accepting for the long term. A properly executed Perception Patterning (or PP) strategy is mind-blowing in its ability to get down to the real issues and grow your self-esteem. It’s all done by first identifying, then addressing the core issues CAUSING your insecurity. 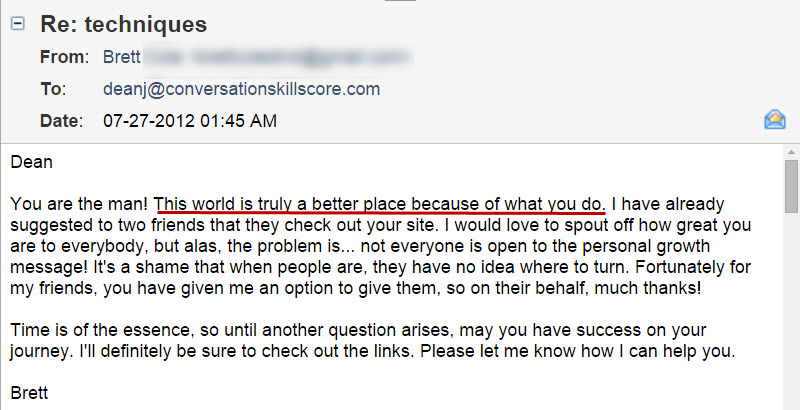 Said differently… I never suggest people “just get out there” without first understanding these deeper issues. I don’t want people to push their comfort zone too far too soon. That only increases the chances for rejection and makes you feel even worse about yourself. 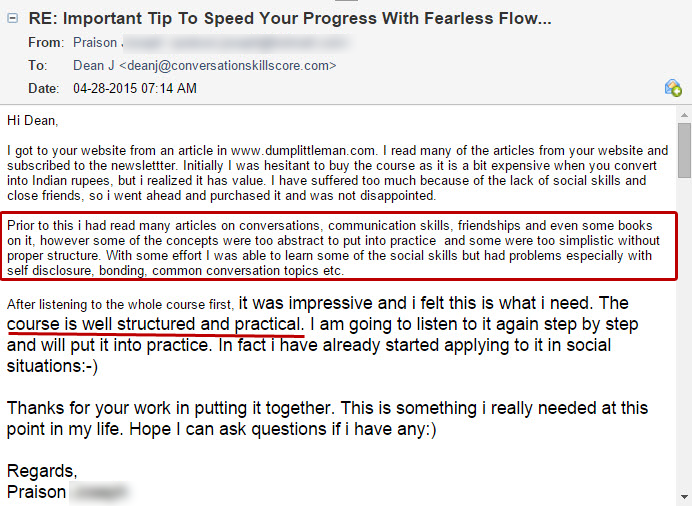 …so I instead give people the tools to eliminate their limiting beliefs. 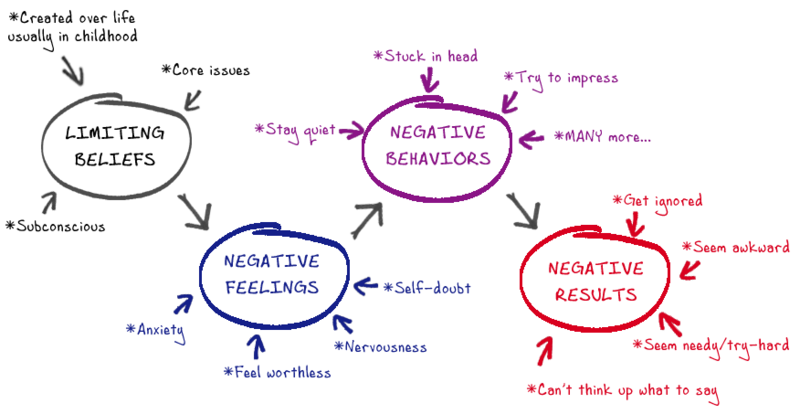 Limiting Beliefs are the main cause of our anxiety, uncertainty, and awkwardness socially. Just like full grown elephants held captive by a small rope and peg. The rope and peg have no hope of resisting the strength of the elephant. But when the elephant was a baby, it was too weak to break it’s binding. So it came to believe it couldn’t escape. 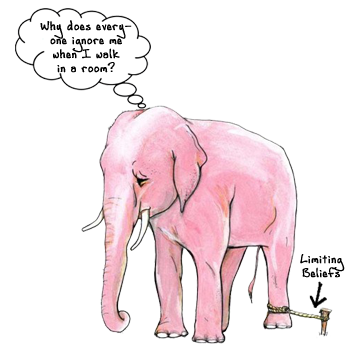 The elephant carried that limiting belief with it to adulthood. Likewise you’ve probably had experiences in your past that hold you down to this day. Making you feel worthless and inferior at times. Causing you to (subconsciously) act in ways that drive people away. …or paralyze you with nervousness so you don’t act at all. Defeating THESE crippling subconscious chains is what GOING DEEPER is all about. And not caring so much what others think. While still inviting them into your life with open arms (and a “take it or leave it” mentality). This attitude… this vibe of confidence and boldness is the MAIN quality people flock to. It’s what will create warm feelings toward you. Even if you currently lack other typical “high-value” qualities like wealth, looks, or life experience. Since you’re being REAL (authentic) with every person you meet, they’ll come to know and like you for YOU. Instead of tolerating the fake, reserved, hollow shell of a personality most people display. That’s the only way true friendships can be formed. These responses are known as Brain Plasticity and Neural Pathways. And they’re the way our minds work. …but simply put, the only way we truly change is through repetition. Any action or thought repeated “carves” new neural pathways into our mind. And when that pathway is “strong enough,” the new skill or mindset becomes second nature. Because our brain has physically changed. Limiting Beliefs exist at a subconscious level. They’ve been CARVED into your mind. This is why simply saying “what’s the worse that can happen” has no effect. So you must install new, empowering beliefs to overwrite the limiting ones. AND a mind free to be creatively spontaneous (and fun) in the moment. …designed specifically to eliminate nervousness and social anxiety. It’s very easy to install new beliefs and skills like this. Ever learned how to ride a bike? At first you doubted yourself and fell a lot. But if you kept at it (with a little guidance), you had some successes. So you started to BELIEVE maybe you can do this. AND your skills improved too. Eventually you were riding that bike up and down the block. That’s installing a new skill set AND belief system. Sure social skills and confidence are a little more complex. But If you can do it for riding a bike (or any other skill), you can do it in your social life too. Carving new neural pathways can be very easy. Your brain WILL change when you give it the right inputs. Gets embedded in there with proper repetition. The PPE are the central ingredient required to make this system work. E1, E2, E3, etc… represent the different carefully designed exercises. Each focused down to maximize results. 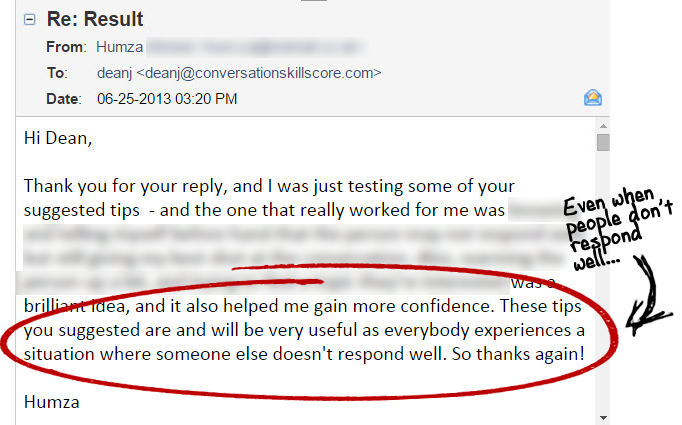 As you can see, BOTH your confidence and skills naturally increase as you move forward. In other words, you “carve” new empowering beliefs AND the ability to flow into your subconscious. And because your self-conscious beliefs change, you care less about approval from others. In turn, this causes people to respect you more. So you experience even MORE success. And then you’re caught up in a positive confidence cycle. Pretty soon, you’ll own people’s attention. …but you can really speed your progress (and reduce your anxiety) by TWEAKING the people and places you socialize with at first (yes some are better than others in the beginning). That way you scale the “intimidation factor” to fit YOUR current confidence and skill level. …and eventually talk to even intimidating people in a fun, effortless, captivating manner. Best of all, when you combine this strategy with your exercises, there’s MUCH less awkwardness. Because your nervousness isn’t triggered as much. And I’m sure you can imagine what will happen when each person you meet experiences more the authentic, carefree YOU without any awkward, anxious vibe to turn them away. First impressions and short(er) attention spans. If people get the feeling you aren’t high-value… it often doesn’t matter how great a person you are. Because it’s likely you won’t get a second chance. You might as well start over on someone new. Trying your hardest yet getting rejected every time. Damaging your self-esteem further. Like some people I’ve met who’ve been trapped this way into their 60s. The changes in our society with the likes of social media, instant media streaming, etc. …have shortened the attention span of almost everyone. Standing out is becoming harder than ever. So if they get a whiff you’re insecure, it’s likely you’ll end up in that “not worth my time” category in their mind. 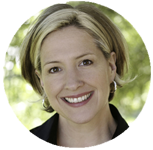 Microexpressions are tiny facial “tells” we all do subconsciously, which reveal our inner state. Other people can (subconsciously) pick up on these subtle cues. Then their mirror neurons recreate your feelings of discomfort inside them. To a lesser degree of course. They can sense you don’t feel confident in yourself. And because “no one has time anymore” they’re likely to move on. That’s why addressing the deeper issues robbing you of confidence is so important. Confidence is responsible for 80% of how others perceive you. Without it… well, get used to seeing that “why are you talking to me” look on people’s faces. Yet nothing gets you fast, positive attention like the TRUE confidence, authenticity and natural skills you’ve seen today. 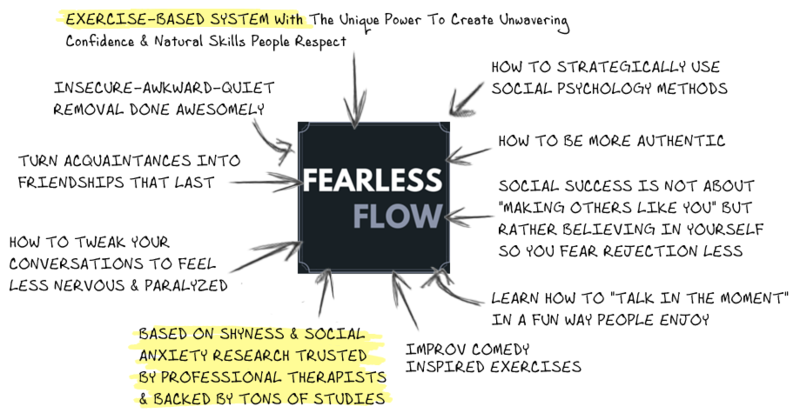 For Fearless Flow students, this creates a huge opportunity. We’re not going to be scrambling for “new impressive things to say” or “body-language poses to stand out” when attention spans get EVEN shorter. 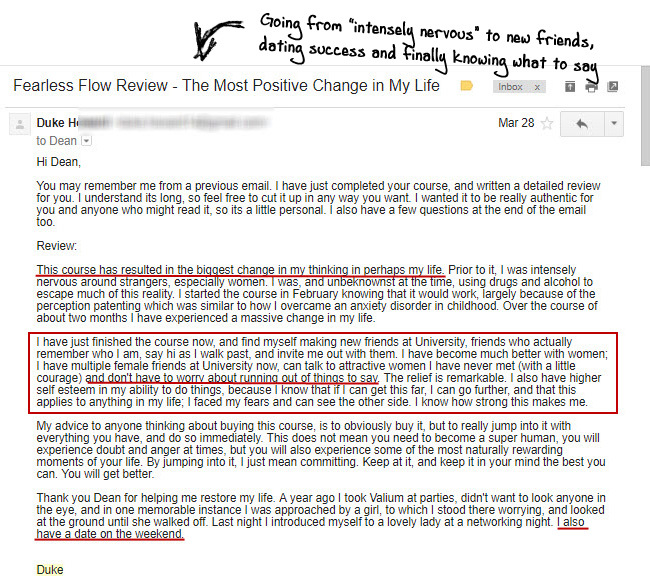 Those of us using Fearless Flow strategies are going to be grabbing real attention that leads to real connections and friendships. Wanna be on the right side too? 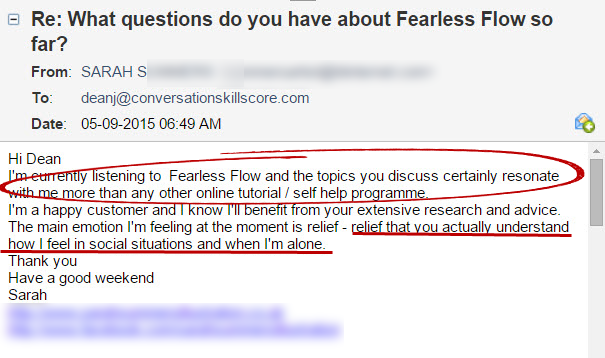 Everything I’ve shown you today is part of the Fearless Flow training course. And making trustworthy new friendships that last. This final version of the program has been in development for over 3 years. It’s been stress-tested and refined to be as step by step, fast and focused as possible. If you’re serious about overcoming your shyness, you should join us today. …even if you’ve tried before in the past but failed. The complete Fearless Flow system is taught over 6 hours of step by step audio lessons. Including the theory and the exercises. Each section builds on the one before it. By the end, you’ll have honed the skills and mindsets to flow easily in conversations. You’ll have the power to connect with people and get them hyper-engaged so they enjoy spending time with you. Placing you in the “high-value” category in people’s minds. Freeing your brain to be quick in the moment, so you always know what to say. Increasing your self-esteem so you’re happier, positive and OK with you. Allowing you to be bold, and live your life fully. Empowering you to make friends, anywhere. All future relationships you build will be as the REAL you. True, trustworthy friendships that last. Immediately upon signing up, you’ll be able to instantly download the Fearless Flow system. The course is series of high-quality mp3 audio files you can listen to from any of your devices: mp3 players, phones, tablets, or computers. So you can listen at home while taking notes or on the go while jogging or driving to and from work. I’ve also included a quick-reference guide (Pdf) so you can see all of the most important principles at a glance. So whether you want to follow along while listening or just brush up on skills later, it’s quick and easy. You also get step by step checklists. No guessing what you should be doing next to make progress. Just follow the steps and check off the exercises as you go. And to make sure you stay on track, you’ll also get an automated teaching email series from me. 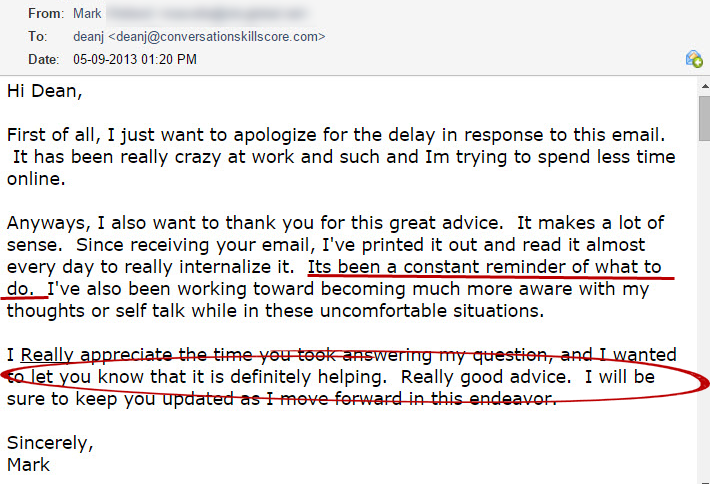 It’s like having me show up at your desk from time to time to give you a little bit of motivation and advice. 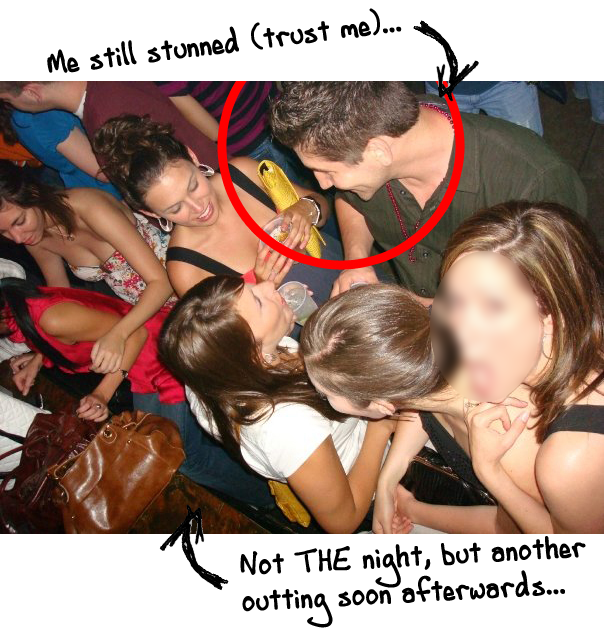 Spend years mastering conversation starters, body-language tricks, word for word routines, meditation, affirmations, hypnosis, you name it — to try and become a “social rockstar” so everyone you meet “loves you instantly.” All the while hoping they won’t realize you’re being fake and manipulative. Use the power of tested social psychology and exercises you’ve learned about today to create a DEEP level of confidence and relevant skills people naturally respect. Even if you aren’t outstanding in other areas of life. Instead of years, this can usually be learned in a couple months… sometimes less. I liked that Fearless Flow is a step by step structured process, that’s really nice. The program has a solid foundation from the ground up is really helpful if you want serious and permanant change. It’s helped because when I want to continue conversation, now I have a process to follow. It also helps me learning more about how humans work. I’d recommend Fearless Flow because it’s practical. Seems like a clear choice to me. That said, the only way to get better and more confident at being social is by… well… being more social. No way around that, even if it’ll only take a couple months max. If you’re looking for instant push-button adoration, this isn’t it. This system is for men and women in their 20s, 30s, 40s and beyond who are ready to forget the “miracle cures”… yet still want the quickest way to achieve lasting confidence and charm. I’ve seen hundreds of conversation techniques and strategies in the courses I’ve bought over the years. Plus the countless hours I’ve spent testing new methods of talking with people. 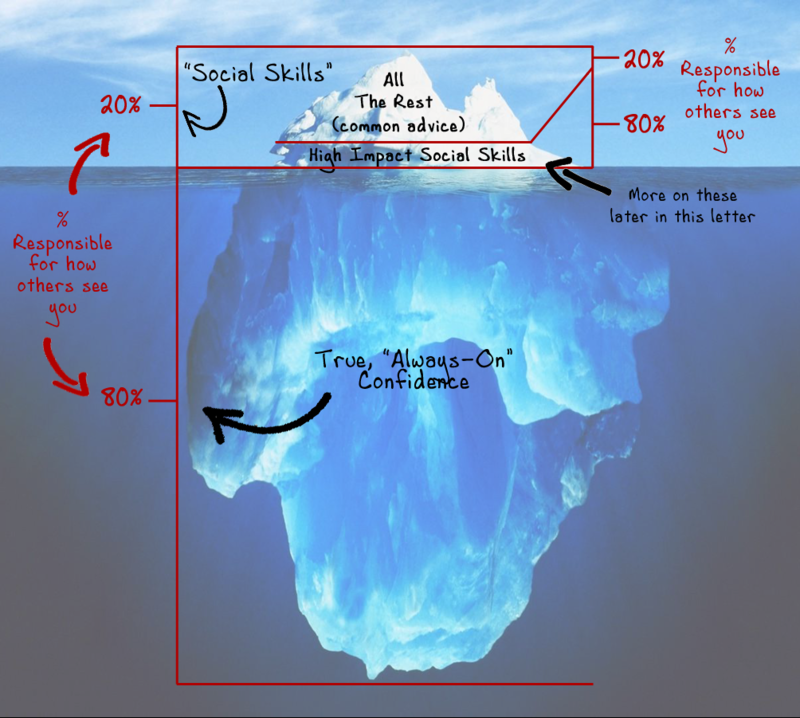 There’s a very reliable set of “high-impact” social skills. These are flexible “techniques” that can be used in any social situation to drastically improve your ability to start conversations, keep them going and connect. If you’re familiar with the 80/20 principle, that’s exactly what this is. They’re the small handful of skills that give you the biggest results with shocking consistency. Add a little of this skill here… A bit of that strategy there… and BOOM! Your “presence” soars. Conversations last longer. Connection deepens. There are 11 of these skills. Individually, each is strong enough to reliably make you more interesting in any interaction. But implemented together…in the order I provide…and even the most mundane conversations become FULL of that electric vibe that leads to connections. These are the same skills I rely on day in, day out to talk to people in a fun and engaging yet down to earth way. That creates friendships naturally. I’ve never revealed these skills together anywhere to anyone. But now, I’m revealing it for the first time for anyone who buys Fearless Flow today. What Would Having True Confidence For The Rest Of Your Life Be Worth To You? I’ve lost count of the number of people who’ve said my strategies have changed their entire approach to becoming more confident and charming (they’re more social for it and everyone around them is better off too). What does shyness and insecurity currently COST you in life? So even at $300, I knew there would be plenty of people willing to invest in Fearless Flow. Makes that $67 you invest today look like a joke, no? This bonus alone has more and better information than most full courses out there. Yet you’re getting it free when you invest in the Fearless Flow system today. This to the point guide finally pulls back the curtain on what people usually talk about when they’re being casual and friendly. Even when they’ve just met. 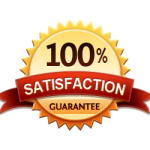 You’re fully protected by the triple guarantee terms. P.S. – It’s time to stop missing out on your life. …but you’ll never be able to look at socializing in the same way ever again. They’ll fade into the background. 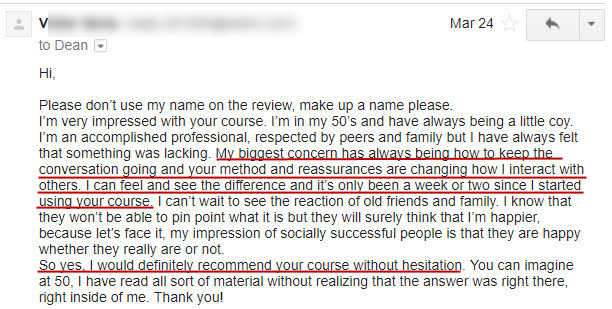 Your course has really helped me. Keep sending me the hint emails. I got to the part about remembering the two sentences and it was working well… I really think this course will change my life. Thank you so much.